If you have a particular hobby or even a profession that you are passionate about, you can write about that. And if you are not passionate about your hobby or profession, maybe you should write about how to change to another! It doesn’t matter whether your passion is woodworking, scuba diving, spectator sports, cooking, mountain climbing or survival camping, you can write about it. Your writing does not have to be purely a broad introduction to the subject, in fact, better not. Find a niche or a sub niche and write about that. Write from a particular angle, such as the science or the social or the family aspect. If you are writing a blog, make your articles long and full of interesting information. If you don’t have a hobby, look for a list of hobbies and choose one. For instance, there are many cooking recipes on line. You can find recipes for old dishes, such as those from Mrs Beeton’s era (Cooking and household management in Victorian England). You can find recipes for tonight’s tea or supper, using ingredients that are easily obtainable and there are recipes for treating various health conditions. Find your favorite aspect and write about that. Two particular cooking blogs come to mind here, possibly because I found some recipes on both of those which have become new family favorites. Both blogs are longer ones and include more information than just the recipes. The first blog provides information from the point of view of economy, nutrition, interest, recycling and growing your own. It often includes information on the science involved in making a meal tastier or healthier and may include different ingredients from what are normally included in a classic version. 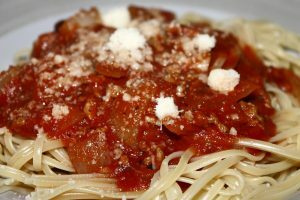 Check out this curated piece of content on making a Quebec version of spaghetti sauce. The full post includes information on why and how carrots can add great flavour and enrich the sauce, and also a little on the chemical reaction involved which means you can apply the lessons learned from this recipe to one of your own. “The better sauces include carrots, which add sweetness to the recipe. The peppers are cut into smaller dice, and the two vegetables are cooked slowly before the tomatoes are added. This prevents the peppers turning bitter and gives a deeper, more finished taste to the spaghetti sauce. No extra liquids are accumulated from the aromatic vegetables, and the sauce is allowed to simmer a long time. So the consistency is thick and rich, and the sauce sticks to your pasta rather than forming a puddle on your plate.” You can read more on the 24carrot diet blog. “…it’s really important to me that my family sits down (most night) and enjoys a healthy real-food meal together. Over the last 34 years, I’ve gotten to know myself pretty thoroughly. In a nutshell, it’s “all or nothing” with me (aka.. my domestic skills are either completely on-going or, well… they’re not). No matter how much planning, how many schedules, what “morning routine” I implement, there will always be those weeks that I’m just tired and “off.” It’s inevitable. So, instead of pretending that each week I will religiously plan on Sunday, shop Monday morning, prep Monday afternoon and then provide my family with a well-balanced meal made with love each night, I PLAN for failure.” … read more about the chicken basil meatballs here. Of course, if you prefer the alternative way of cooking meatballs, you can check out a different blog post. If you read through the two blog posts, you will see that each writer takes a different angle, though very similar; and neither provides you with JUST a recipe. You get helpful hints, time savers, flavour improvers and much more. What is YOUR hobby, profession or passion? What angle could you take in presenting it? Who is your possible or intended audience? What do THEY want to know? If you don’t have a profession, find a list of professions and choose one you would like. Write about how you would set about getting into that profession.